Who invented Candy? The invention of candy dates back to ancient times when when people first discovered uses for the sweet honey produced by bees. Sugar was first manufactured during the Medieval period but was very expensive. Cacoa originated in South America and was first used for chocolate flavored drinks. The names of the original inventors of candy are unknown. Who invented Candy Bar? We do however know the name of the person credited with inventing the Candy bar. His name is Joseph Fry (1795 - 1879). Joseph Fry is not only famous as the English inventor of the Candy bar but also as a doctor, apothecary and businessman. When was the Candy bar invented? Joseph Fry invented the Candy bar in 1847, during the Industrial Revolution period of invention (1700 - 1860). Definition of Candy: Candy is defined as a confectionery, or sweet, made of flavored sugar and colorings, often combined with fruit or chopped nuts. It is made by boiling sugar or molasses and then molding, crystallizing, or working to the required shape. Candies are often completely, or partially, coated with a layer of chocolate, caramel, fondant or paste and sprinkled with cocoa or powdered sugar. The word candy is derived from and old French term meaning crystalized sugar. Definition of the Candy Bar: A Candy bar is defined as a solid type of sugar confectionary that is in the shape of a bar, that is usually covered in chocolate. Technically, anything sweetened with sugar or syrup can be classified as candy. Fact 1: Who invented Candy? Honey has been used as a sweetener since Ancient times. Spanish cave paintings dating back to 7000 BC depict scenes of early beekeeping and the Ancient Egyptians, Greeks and Romans all used honey to create sweet sensations. Fact 2: Who invented Candy? The history of sugar can be traced to India when Alexander the Great marveled at sugar, referring to it as "honey without bees". Fact 3: Who invented Candy? The Muslim conquest of Sicily began in 827 AD and Arabs began to cultivate sugar in Sicily and then Spain. It was not until after the Crusades (1095 – 1291) that sugar began to rival honey as a sweetener in Europe. Fact 4: Who invented Candy? The Spanish began raising sugar cane in the West Indies in 1506 and sugar was first grown in Cuba in 1523. Fact 5: Who invented Candy? The European conquest of the 'New World' led to the discovery of Chocolate. Chocolate, derived from the beans and seed of the cocoa tree (called the cacahuaquchtl), was used by the Mayans and the Aztecs as the basis for a thick, cold, unsweetened drink called xocoatl. Sugar was unknown to the Mayans and Aztecs, who used different spices, hot chili peppers, to add flavor to the chocolate drink. Fact 6: Who invented Candy? Christopher Columbus brought back few dark brown cocoa beans to Europe and Cacao was also discovered by Spanish explorers, led by Hernan Cortez, in Mexico in 1519. The Spanish Conquistador Hernan Cortez (1485-1547) believed that that if the bitter beverage were blended with sugar, it could become an appealing, exotic delicacy. Fact 7: Who invented Candy? The Spanish mixed the cocoa beans with sugar adding the flavorings of vanilla, nutmeg, and cinnamon. The results became highly coveted, fashionable and exclusive drink reserved for the Spanish nobility. Spain hid the secret of the cacao beans from the rest of the world for almost 100 years! Fact 8: Who invented Candy? Drinking Chocolate became the rage across Europe. Cacao plantations spread, as the English, Dutch, and French colonized the New World. Fact 9: Who invented Candy? During the Industrial Revolution new processes were invented to make the production of chocolate more efficient. In 1928 the Dutch chemist Coenraad van Houten created a press to remove half the natural fat (cacao butter) from chocolate liquor, which made chocolate both cheaper to produce and more consistent in quality. The end result became as "Dutch cocoa". Fact 10: Who invented Candy - The Candy Bar: The machine pressed "Dutch cocoa" led to the transformation of drinking chocolate to its solid form - the candy bar. Fact 11: Who invented the Candy Bar? The Candy bar was invented by Joseph Fry in 1847. Joseph Fry learned to make molded chocolate into the shape of a bar by adding back melted cacao butter. His invention transformed chocolate from a drink into a portable snack. Fact 12: Who invented the Candy Bar? The early years of Joseph Fry (1795 - 1879) were spent in Wiltshire, England where he was raised by his family. Joseph Fry was educated at excellent education and became a doctor and apothecary. In 1866 they produced their famous Fry's Chocolate cream bar. Fact 14: Who invented Candy Bar? In 1875 the Swiss chocolatier Daniel Peter (1836 – 1919) invented milk chocolate by mixing a powdered milk developed by Henri Nestlé with the melted cacao butter. Fact 15: Who invented Candy Bar? In 1879, the taste and the texture of chocolate was further improved even further when Rodolphe Lindt (1855 – 1909), the Swiss chocolate manufacturer and inventor, invented the conching machine, mixer and agitator, that reduced the sizes and 'polished' the particle of both cocoa solids and sugar crystals. Fact 17: Who invented Candy Bar? In 1893 Milton Hershey opened his chocolate factory in Pennsylvania and created what is known as the first "American" candy bar. In 1900 Milton Hershey invented Hershey's Milk Chocolate Bar. In 1906 Hershey's Milk Chocolate Kisses appeared in their iconic silver foil wrapping. Fact 18: Who invented Candy Bar? In 1908 Theodor Tobler (1876–1941) and his cousin Emil Baumann invented a Swiss Milk Chocolate and Honey and Nougat infused candy bar that they called called Toblerone. Fact 19: Who invented Candy Bar? In 1911 Ethel and Frank Mars open a candy company in Tacoma, Washington which would later become later Mars, Inc., one of the largest, privately owned candy companies in the world. Mars introduced the Milky Way Candy Bar in 1923 and the Snickers Bar in 1930. Mars produced “M&Ms” in 1941. Fact 20: Who invented Candy Bar? Walter Diemer invented Bubble Gum in 1928. Fact 21: Who invented Candy Bar? In 1931 the first novelty candy, Tootsie Roll Pops, were introduced, which combined two candies into one. Child actress Shirley Temple sang "On the Good Ship Lollipop" in the 1934 movie Bright Eyes. 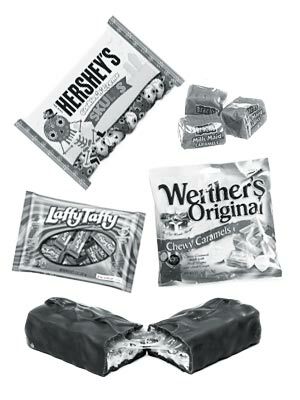 The lyrics mentioned the Tootsie Roll together with many other types of candy. Fact 22: Who invented Candy Canes? The earliest verifiable reference to candy canes is a record of a 1837 Exhibition, although the name of the inventor is unknown. By 1882 canes were being hung on Christmas trees and the Bunte Brothers, confectioners based in Chicago, filed one of the earliest patents for candy cane making machines in the early 1920s. In 1919 Robert McCormack of in Albany, Georgia began making candy canes for local children and by the middle of the century fo his company 'Famous Candy Company'. Click the links if you would like to know who invented Bubble Gum, who invented Cotton Candy (Candyfloss) and Who invented Chocolate.